This site is dedicated to a famous French writer Jules Verne, "father" of the science-fiction, and to his novel "Mathias Sandorf". My born-town, Pazin, owns to this great writer a gratefulness because of placing important parts of a plot in "Mathias Sandorf" right here, in Pazin, the heart of Istria, in it's ancient Castle and deep and mysterious cave, which gorge inspired human imagination centuries ago. "Mathias Sandorf" is 27th novel of Jules Vernes opus called "Extraordinary Voyages". A novel was published at 1885. (Hetzel, Paris), but Croatian translation is published 103 years later, at 1988. ("GZH" Zagreb, translator: Morana Cale Knezevic). As in original, Croatian edition also contains 111 illustrations by Leon Benett, and like Verne in words, Benett described in pictures also places on Croatian side of Adriatic coast: Pazin, Limski Kanal, Rovinj, Dubrovnik, Gruz and Boka Kotorska. 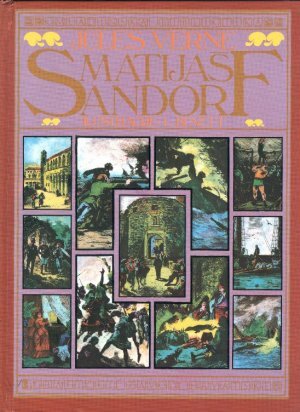 A novel "Mathias Sandorf" had two stage-adaptations, as a play, and three film-versions: first, silent movie at 1920 (directed by Henry Fescourt); a 1963 film (directed by Georges Lampin), and a six-part TV-serial at 1980 (directed by Jean-Pierre Decourt). CONTENT OF THE NOVEL "MATHIAS SANDORF"
JULES VERNE'S SOURCES FOR "MATHIAS SANDORF"